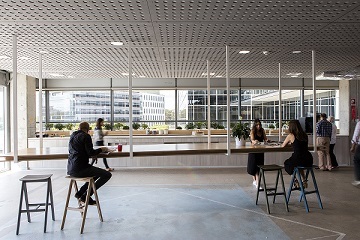 In an attempt to improve employee wellness, innovation and leadership, Frasers Property Australia (formerly known as Australand) has unveiled its new head office located at the Rhodes Corporate Park in Sydney. 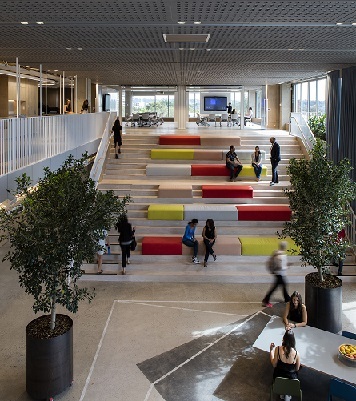 Architectural practice BVN, in conjunction with Frasers Property’s commercial division, led the $9.8 million fit-out comprising 3,700 sqm spread across two levels. Reini Otter, executive general manager commercial & industrial, said the design reflects the corporate values and culture of their business, as well as their future aspirations. “What I personally like best is the inherent passive design approach that we have adopted here that encourages movement,” Otter told HC. “This include basic things – for instance, we all come in the one entry door which has a social aspect to it as well. “Additionally, we have one central communal café and kitchen area called The Steps, whereas before we had four separate areas. “Everybody also has lockers rather than storage at their desks - so all of these passive measures means that you have to move more." Otter added that it’s not a ‘ram it down your throat’ kind of wellness approach. Rather, it’s a smart, passive design that encourages the outcomes that they want. “What we are noticing is that the cultural aspects are great as well,” he said. “You have got more visibility among people, people are seeing each other more and they are speaking more. Otter said the company also wanted to encourage a much higher level of engagement and knowledge sharing both within teams and between teams. “One thing we are very focused on in our business is empowering the right people and giving them the autonomy to do their job effectively,” he said. Create authentic places that inspire creativity and passion. Provide choice to support a variety of activities. Enable and connect with seamless technology. Bring the customer into the heart of the business. 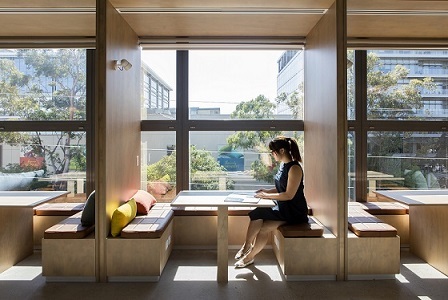 “Fundamental to the design is the belief that the built environment can directly affect our health – making employee wellbeing a top priority,” added Reini. High quality and diverse break out and private spaces including quiet rooms, booths and benches. End of trip facilities including showers, lockers, change rooms and a bike repair kit have been built into the space, equivalent to a five star hotel quality to encourage exercise either on the way to work or during the day.